Want to start your little ones sailing? Try out our family sailing group ‘Saturday Sea legs’. 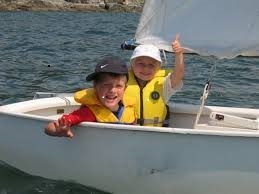 We accept children from age 5+ and introduce them to sailing and other water craft in a fun and safe environment. They will learn water safety, boating terms, a little sailing and will make loads of new friends. This course is open to WHSC members and non-members. Hi – you mention that the Family Sailing Session runs every Saturday Morning from the 1st of July. Is there an end date when this session will no longer be run? This query has been passed on to the Family Sailing Organisers. We will post an update when we have it *CORRECTION* alternatively you can get in touch with Dinghy Secretary Andrea Quinlan decandq5@gmail.com who is looking after Family Sailing this year.